Artist and industrial designer Dino Sanchez’s work features clean lines, minimalist style, and a zen vibe. He brings this same sensibility to his first kid-friendly product, TOTEMS, a set of blocks which he promises were designed for all ages. The set comes with four handmade blocks, each featuring a different “face,” crafted from solid oak and walnut with non-toxic finishes in Massachusetts. Arranging these blocks into a totem pole makes for a cool, mix-and-match stacking experiment, but we also like the idea of combining them with other block sets to create robots and a variety of fanciful creatures. Artist and industrial designer Dino Sanchez's work features clean lines, minimalist style, and a zen vibe. He brings this same sensibility to his first kid-friendly product, TOTEMS, a set of blocks which he promises were designed for all ages. 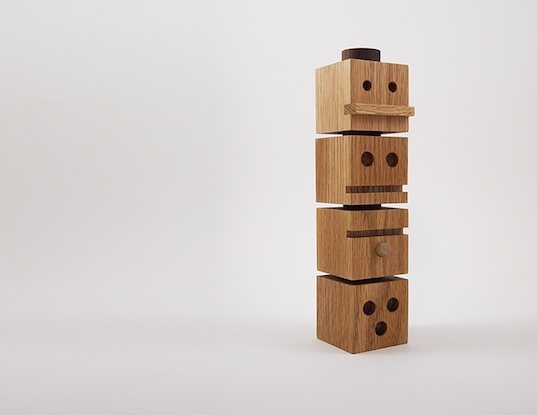 The set comes with four handmade blocks, each featuring a different "face," crafted from solid oak and walnut with non-toxic finishes in Massachusetts. Arranging�these blocks into a totem pole makes for a cool, mix-and-match stacking experiment, but we also like the idea of combining them with other block sets to create robots and a variety of fanciful creatures.